Recently at a workshop that focused on the events of October 26 and thereafter, a participant remarked that the one thing that stood out with respect to the Prime Minister Ranil Wickremesinghe was his ability to maintain grace under pressure for the duration of the coup against the Constitution. There are many who have alluded to his gentlemanly qualities in politics and his famous departure from Temple Trees without fuss when the election result was unfavourable. His behaviour throughout the coup, when he stood as the constitutional and legally elected Prime Minister of Sri Lanka, must be added to his profile as a leader with a keen sense of constitutional propriety and most importantly, with a sense of the conventions of parliamentary democracy. Steven Levitsky and Daniel Ziblatt in their work, ‘How Democracies Die’ have written about the importance of mutual tolerance and institutional forbearance for a fully functioning democracy. These values are not translated into constitutional articles per se but underpin the political culture as deeply embedded values that have also become conventions in the parliamentary sense and make the constitution work as it is intended to. Wickremesinghe is perhaps the only politician who now embodies this, after decades in politics and government. Like it, love it or hate it, the other salient point about Wickremesinghe is his vision for Sri Lanka- something again, no one else seems to have. Of course, it has evolved over the years and indeed it should have. From neo-liberal roots it has metamorphosed into and is presented to us as a social market model of development that aims at turning this country into the hub of South Asia. The plans combine focus on infrastructure along with technology for a future of citizens of a fully functioning democracy and not just a formal one. While addressing current grievances, this vision aspires to a country in which there will be unity in diversity –where being of an ethnic community or religious faith does not in practice prevent the flowering of your innate talent and abilities. And in respect of constitutional reform, the commitment is surely to the abolition of the executive presidency and to the moving of the balance of powers of government and governance back to Parliament with all its checks and balances? In this respect,Wicremesinghe is the longest serving parliamentarian, and moreover, the one who understands the ground rules, the grammar as well as the nuances of parliamentary democracy, like no other. And he has a commitment to strengthen its institutions through reform to the committee system in Parliament. I understand that in his incarnation as a politician, Wickremesinghe warns against peaking too soon in the playing out of the political dynamics of the day. This does though limit the time for communication, when in government, of achievements and progress on commitments made during the campaign. All of this need to be communicated and in political terms ‘spun’ when need be. It is forgotten that Wickremesinghe has been at the helm of major policy reform – from the Nineteenth Amendment to the Right to Information legislation to the Office on Missing Persons, the Office of Reparations and the legislation on the Commission on Truth, Justice and Reconciliation, as well as on the repeal and replacement of the Prevention of Terrorism Act. This government has won back GSP Plus and the Millennium Challenge Account money. It has restored a clear measure of fiscal discipline to the economy and yes, more is required. The issue though is as to whether the country at large is aware of what he has accomplished or whether the anti- populist political profile that his opposition has crafted, often referred to as elitist and alien, cosmopolitan and globalist, has stuck. Perhaps, the focus of the Budget on Gamperaliya will provide the opportunity to engage with the people and bring them alongside one’s priorities. The challenge is to retain the cosmopolitanism and globalization as relevant and important for twenty- first century Sri Lanka and transform the charges of being alien and elitism into the inclusion of all citizens to take this country forward to the prosperity we aspire to and deserve. Above all else this must be communicated on social and mainstream media and to our fellow citizens at community level. 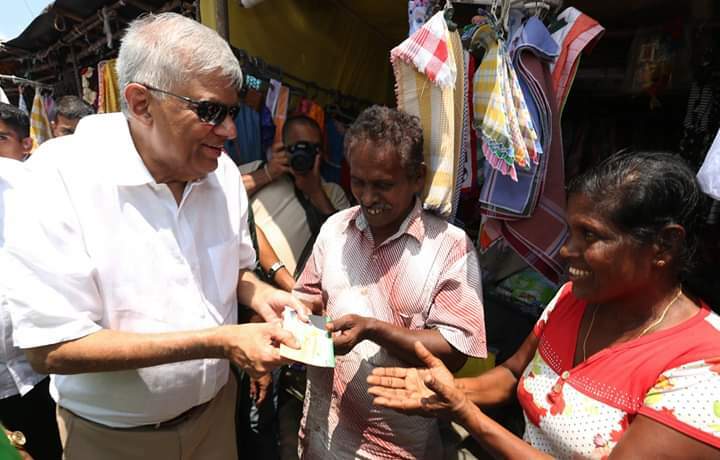 Ranil Wickremesinghe’s ideology has clearly evolved, shifting from its moorings on the right, to close enough to the liberal left on civil and political issues and to some extent the economy too. In this respect he has grown as a politician and to the high point of not capitulating to the coup, but standing straight as the legal and constitutional Prime Minister of Sri Lanka. For that he deserves our deep appreciation and admiration.